Liverpool will host fifth spot side Tottenham Hotspurs in a Barclays Premier League game tomorrow at Anfield. Lucas Leiva is likely to miss this game after having a minor knock against Everton. Lazar Markovic is likely to take his role back from Jordan Ibe. Daniel Sturridge could start his first game since returning from the injury. Raheem Sterling and Philippe Coutinho are having fitness issues but are likely to pass the test. Spurs continue without any injury problems. Mauricio Pochettino will have a fully fit squad to choose from. Harry Kane who performed exceptionally against Arsenal last weekend is going to lead the attacking line once again. Defender Federico Fazio is likely take a bench once again after Eric Dier decent perforamces agasint the Gunners. Nacer Chadli could take Moussa Dembele place which would bring Christian Eriksen in the central role behind striker. Earlier this season, Liverpool won by three goals to nil at White Hart Lane. Liverpool have won their last four games against Spurs, keeping three clean sheets in four. The Reds have scored atleast two goals in their last five home wins against Spurs. Liverpool are unbeaten in their last six Premier League games. Last time Spurs won at Anfield in 2010-2011 season. Spurs have lost one of their last six Premier League games. 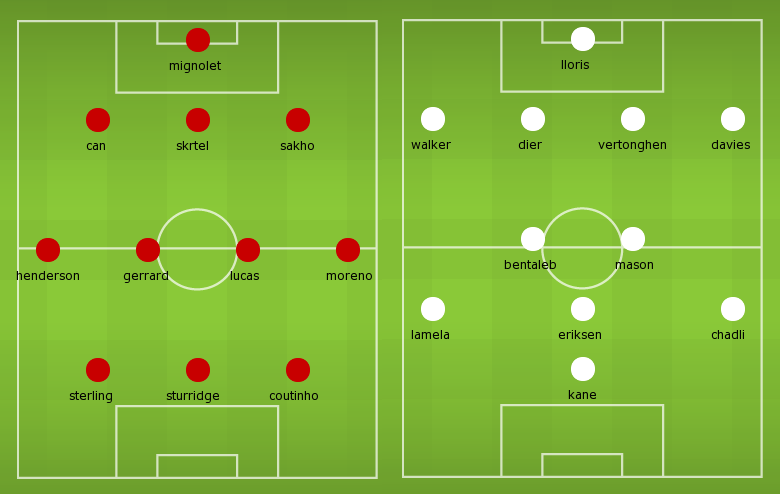 Liverpool 2 – 1 Tottenham, Spurs star Harry Kane is man to watch for this game, he is likely to be on the scoresheet.